To begin our session, I gave a brief introduction to the team behind KAMI, and explained the playgroup's objectives and guidelines. 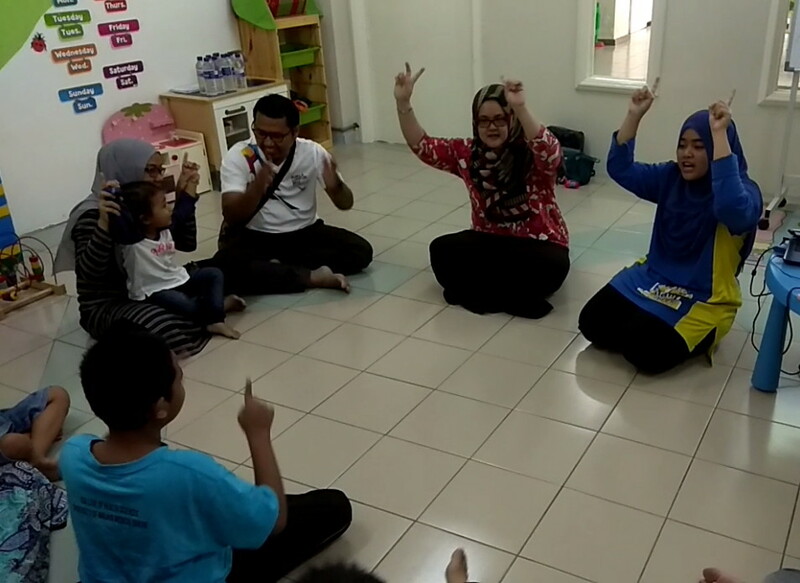 This was folowed by a brief welcome address by Puan Salmah and a doa session led by Teacher Ami from Excel Qhalif. As a warm up, we did our first music & movement activities while sitting down. We sang Heads, Shoulders, Knees and Toes, and One Little Finger. For the second part of the music and movement activity, we got on our feet and danced to the popular Baby Shark Doo Doo song. This was followed by our first gross motor activity for the day, which was Bean Bag Pass. We sat in a circle and tossed bean bags to the friend on our right. Then, we were teamed up in pairs and tossed bean bags to the person sitting opposite us. This gross motor activity is aimed at preparing the body, before we prepare the mind with table tasks. For our first table task, we did The Coin Drop, which is a fine motor activity. The children took turns to pick up plastic coins from a tray and drop them into a jar. Parents assisted by prompting and encouraging their children. Our final activity for the day was arts and crafts. The children tore their coloured paper, with help from mum and dad, and pasted the paper pieces onto the apple template given. This activity encourages fine motor skill, focus on a task, joint attention and also sensory stimulation to different textures (paper and glue). Once everyone was finished with their arts and crafts activity, we cleaned up together and sang the Goodbye Song. My son Arif with his father working on their apple collage. 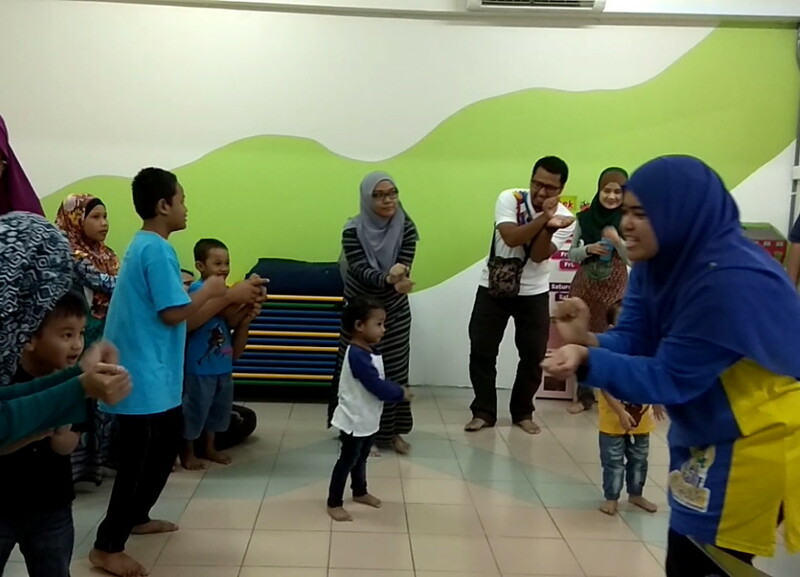 In the beginning, Arif didn't want to join in the activities. He preferred instead to explore the space. It wasn't until he heard the Baby Shark song that he came into the activity room and stuck around. He was a bit resistant at first to the gross motor activities like Bean Bag Pass, but he really enjoyed the table tasks, like The Coin Drop and collage. What will KAMI Playgroup be up to next week? Stay tuned!